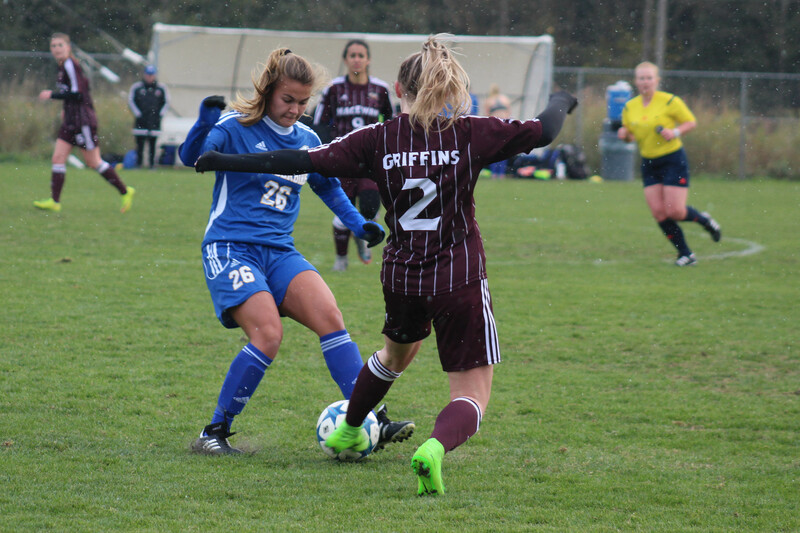 Earning a bit of redemption on Saturday, the UBC women’s soccer team scored two goals in three minutes to one-up the MacEwan Griffins and claim the Canada West bronze medal. 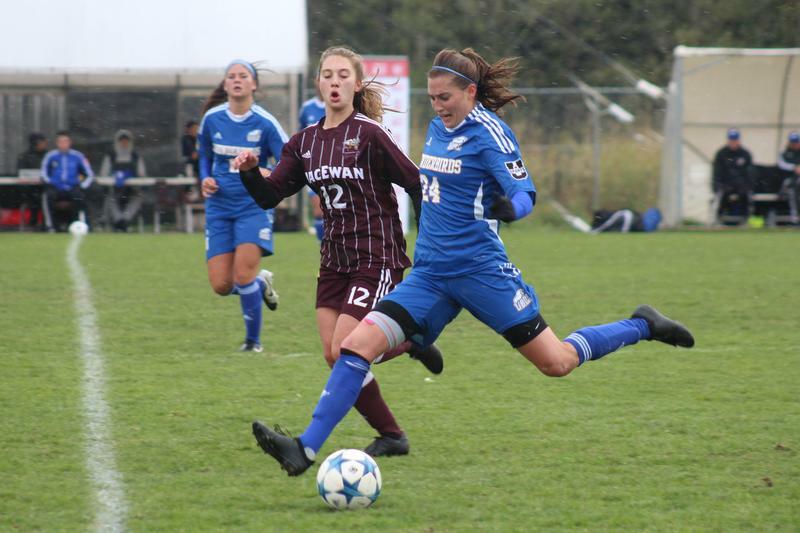 After a head-scratching 3-0 loss to the Trinity Western Spartans on Friday night, the Thunderbirds came out looking more like their usual dominating roster on Saturday, though not fully-fledged until the second half. In the first, MacEwan took advantage of the counterattack game, keeping UBC’s defence busy through most of the half — initially, MacEwan looked more likely to get on the scoreboard. They did just that in the 17th minute, as Griffin’s midfielder Suekiana Choucair swung a corner kick off of the fingers of UBC keeper Marlee Maracle and into the upper netting, putting the Alberta side ahead 1-0. Taking the defensive hint, UBC resorted to old ways to help get them to half, moving striker Aman Shergill back into her former central defensive role to fill in the gaps appearing between UBC’s back line. The ’Birds would keep the Griffins at bay until half, heading back to the dressing rooms with a surmountable 1-0 deficit on their hands. Whatever was said at half-time seemed to work in UBC’s favour, as they came out looking more like their usual dominant selves at the restart. With better connection from defence to strikers, and with Rachel Jones and captain Jasmine Mander finding more of the ball in the centre of the park, the T-Birds started to break down the Griffins with their quick ball movement and long balls down the wings. They would capitalize on their half-time revival in the 50th minute, as a cross from Jones on a short corner would find the head of rookie defender Kassie Kirlik, who sent it soaring into the back of the net. Three minutes later, Aman Shergill would send a cross in to first-year midfielder Tess McRae at the top of the six-yard box, who would double UBC’s tally and put them one goal ahead. 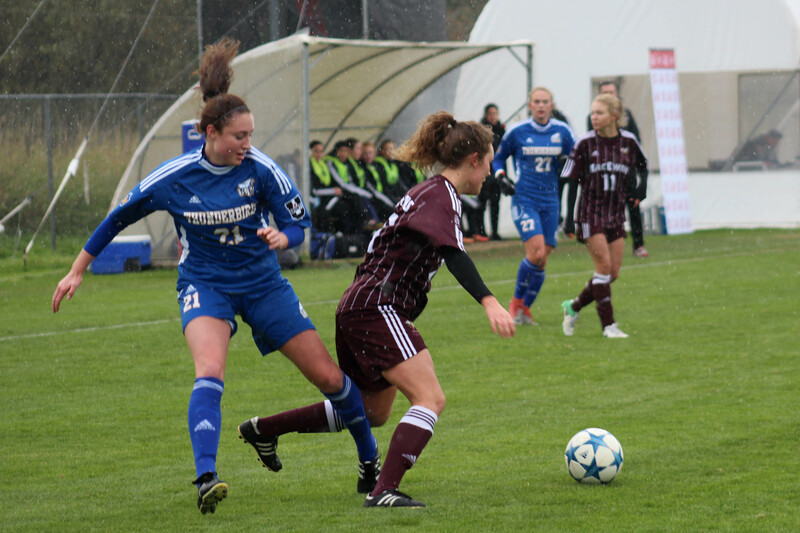 For the remainder of the match, MacEwan looked to be tiring against the onslaught of UBC’s attacks. Though they would find their way into UBC’s box with a flurry of corner kicks in the final five minutes, they wouldn’t be able to make up the one goal difference. With that, UBC claimed a 2-1 victory, ending their season with a bronze medal victory in Canada West. Though they came into the tournament as the two-time defending Canada West champions, UBC will settle for a top three finish just behind the University of Victoria Vikes and the newly crowned Canada West champions the Trinity Western Spartans — Trinity defeated the Vikes 2-1 to claim top prize on Saturday evening.